Here’s the vision: vanilla bean and ginger holding hands in a field of sweet potato, with pretty bursts of lime lighting their way, and just a touch of heat. This recipe came about when I looked in my pantry and screamed “Is there anything at all interesting in here???!? !” The vanilla beans were like “Uh, hello, try us in soup?” So what if my blog has accidentally tripped and fallen face first into a big soup pot? It’s March and it’s dreary, and I can hardly manage to tie my shoes on these gray days, never mind cooking something any more complicated than soup. Plus, this one has special powers! For one, the aromatherapy. Try to feel seasonal affective disorder as the delicious scents of ginger and vanilla waft through your abode. For another, teleportation. I don’t know about you, but I don’t cook with vanilla every day. It took me on a much needed vacation away from my comfort zone, to a more intriguing place. So my vision for this recipe was a short but sweet ingredient list with nothing superflous and nothing wasted. Pure, clean flavors. I suppose I wanted to be the Raymond Carver of soup. Hope you love it! And hopefully the next pic I post will look like spring, and not Thanksgiving. Haha. ~ Everything gets pureed in the end, so don’t stress too much about chopping things too perfectly. ~ My favorite method of scraping the vanilla bean is to slice the bean across the waist, using a steak knife. The slice each half lengthwise, and use the steak knife to scrape out all the delicious vanilla beaniness. ~ My little container of vanilla beans reminded me not to discard the skin! Throw empty vanilla skins into a cup of sugar, cover, and let it sit around for a week or so, giving a stir every now again. BOOM! You have vanilla sugar. Put it in your coffee or something delicious like that. Preheat a 4-quart soup pot over medium heat. Saute the onions in oil with a pinch of salt for about 3 minutes, until translucent. Add ginger and red pepper flakes, and saute another minute or so. Add yams, veggie broth and salt. Cover and bring to a boil. Once boiling, lower heat a bit to a slow simmer and cook until potatoes are tender – usually 5 more minutes or so. Once tender, add the vanilla beans. 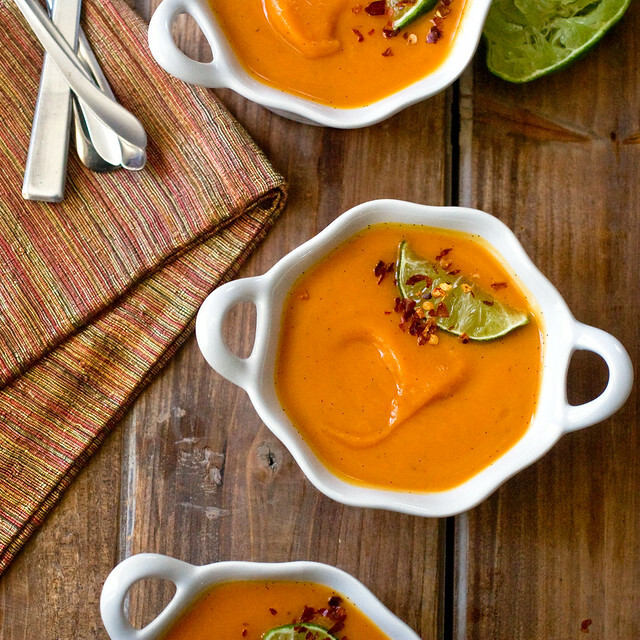 Use an immersion blender to puree the soup until smooth. Or transfer the soup in batches to a blender or food processor to puree. Be sure to let the steam escape in between pulses so that the steam doesn’t build up and explode all over you. Then transfer the soup back to the pot. Add maple syrup and lime and taste for salt. Thin with a little water, if necessary. You can eat immediately, but the flavor develops a lot as it sits. The lime mellows out and the vanilla becomes more pronounced, especially the next day. Serve garnished with lime, if you like. You may also want to do a coconut swirl, or something like that, if you’re feeling fancy. I hate being one of those people that asks if they can sub coconuts for chili powder, but is there any way to use vanilla extract instead of vanilla bean? Thanks. I don’t think it will taste as good as vanilla bean! I’d just skip it in this recipe and have a gingery soup. Amazeballs! Any suggestions on something to pair this with to make it a complete dinner? Maybe like a bahn mi? I think that’d be good! It’s still cold enough for soup! At least where I live. This looks like a great big bowl of comfort and deliciousness. Looks divine. You may not use vanilla bean much, but I see you managed to get your trademark Maple Syrup in! Haha, do I use maple syrup a lot? You can use agave, too. Or sugar. Would cinnamon work instead of vanilla? Or would ginger and cinnamon be a totally weird taste combo. I’m just omitting the vanilla, if so, as I have no idea where to get it in m little Italian city! PS. I went vegan only four months ago and your blog has saved me countless times. It’s amazing, thank you. This soup is so so gorgeous! What what?? This looks so good. Can’t wait to try it! LOOOOOVING this recipe. Great tips you have offered. Made this tonight and am so glad I didn’t cut the recipe in half – can’t wait for leftovers tomorrow! This was so flavorful and thick. Usually I don’t add the full amount of broth called for in recipes, but I had to in this case to cover the potatoes. Glad I did because it came out perfect. Thank you for another flawless recipe! I made this today and it was divine! Even my mother ate it, and she generally dislikes what she terms “weird” flavor combinations. She’s requested more! Not sure how well it would freeze, but I went ahead and put some in the freezer, so we’ll see. A shout-out to Raymond Carver? Awesome! And the soup looks great too! 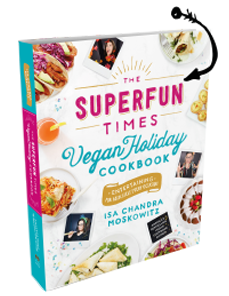 Isa, just to be clear: I adore your site and your books, and recommend them as my top pick in my vegan advocacy. You truly rock! So just one picky point here (and I also write as a former pro pastry chef): for scraping the vanilla bean, how about recommending a paring knife instead of a STEAK knife, given your audience and the values we’re all trying to promote? I know, a minor point of language, but still… Making the soup this afternoon, and will think warmly of your incredible contribution to the planet. A steak knife works better because of its flexibility and serration, and I really don’t think that this conflicts with my values. Owning a “steak knife” is not, like, a slippery slope to eating animal products. You’re welcome! Got it and thanks — for me, I find the serration a problem: it misses bits, and I prefer a short straight blade for effective and thorough. And I hadn’t thought owning a steak knife would be a slippery slope; it’s just my own being mindful of equipment and terminology that reinforces domesticating butchery, that’s all. Peace! My goodness, I made this tonight and it’s wonderful. As a soon-to-be new momma testing out future go-to recipes, I so appreciate how quick and easy this is to make, and the end result was tastier than I expected (that red pepper packs a punch!). On a side note, I’ve been known to sub vanilla extract for vanilla bean (sorry) and I don’t think it hurt this dish at all. (And, while it cools on my counter… do you think this would freeze well, Isa? Because it would be delicious with a warm chunk of bread in a few weeks…) Thank you, as usual, from a devoted fan. You rock. Made this tonight! Yum, thank you! Yam yellers are silly. I am making this tonight! I’m curious as to why the instructions say to add the maple syrup and lime after pureeing (in the blender for me), and not before. Is it to let the soup cool down a bit and not change the taste of those ingredients? You always have such wonderful tips and culinary insight, so I’m sure there’s a good reason! I have been slowly moving toward a more vegetarian diet, and this recipe was my first major “serious” vegetarian dish. Unbelievably good. I made it twice. Both times for various friends and they were very impressed with the quality. 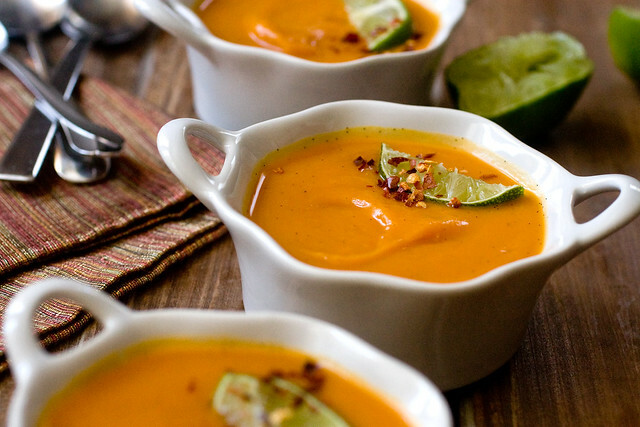 This soup is delicious and complex with flavor. I didn’t have red pepper flakes, so I used about a tablespoon of sriracha with much success. It’s just sweet enough and is quite filling. Deeeeeelish! I wasn’t quite sure if I was supposed to use the vanilla bean, or the stuff you are supposed to scrape out of it, so I did both! The first batch with the bean husk, and the second batch with the insides of the bean. Didn’t change the flavor a whole much, but using the inside ads cool-looking little black vanilla bits to the orange soup. this is SUCH a newbie question, but do i really only boil for 5 minutes? I have never made sweet potato soup, only regular potato and i usually boiling for 15…or am i just butchering this either way? Sweet potatoes cook much faster than white potatoes! But definitely cook until tender, however long that takes. thanks isa! I boiled for closer to ten minutes, but HOLY COW is this amazing!!! Isa, you are a genius! I’ve made it twice now already with extra ginger in the second batch and this is so crazy good! HOW have i never made sweet potatoes into a soup before!??? Okay, I have to ask this. Could I NOT use much, if any, onion? I just tried making a pumpkin pasta sauce last weekend and ALL I could taste was the nasty onion and black pepper. I followed the recipe exactly and I just can’t see how people would think that tastes good! 🙁 So I would prefer NOT to replicate that. I’m not an onion lover so I don’t want to taste it. Make sense? 🙂 So will the recipe still work with MUCH less of the onion or can I omit it all-together? This looks lush…guess I know what I’m making for lunch tomorrow! Such a gorgeous, satisfying soup. The perfect touch of spiciness. (It sounds like I’m describing my ideal boyfriend, eh. Well, soup beats boys any day.) I served this soup at Thanksgiving and even the most skeptical omnivore attendees gobbled it up. Thank you Isa! You’re a genius. This recipe was amazing, I was snowed in so I had to use what I had, I did not have ginger, and I did add some curry powder, but other than that followed it to a tee. Great recipie and great website! yeah, this soup is really f@#%ing good. Thank you — made this tonight and the flavors were amazing! I seem to be the substitution queen. If we cannot have the red pepper flakes what else would you recommend? Would it be okay without it. I love your site. Just bought three of your books and cannot wait to dive into them. I made this soup last night and it was awesome!! I’m quickly realizing that my immersion blender was the best investment ever! The soup was quite spicy with 1/2 tsp pepper flakes, a bit much for me, but the spiciness does compliment the sweetness so nicely! I didn’t have any vanilla beans so I added about 1 tsp vanilla extract…it was lovely. Made this for the sixth time. After relative success using a blender, I finally got an immersion blender, and could not be more thrilled with the results. The whole recipe improves once you get the texture right. Love this site. I haven’t run into a bad recipe on this yet. Viva Isa. I cooked this overnight on the warm setting on my stove so that I can enjoy it for lunch today. Came out nicely. This is definitely one of those foods that you have to think about and be present as you are eating it in order to enjoy it more fully. So good, pretty spicy though. Next time I might put less ginger and pepper flakes and I bet it would still be good. Also, I went for the Cuisinart instead of the blender which was probably a mistake because I bit into a piece of ginger or two. Make sure it’s nice and blended! In response to Rebecca, I always have success with paprika or Portuguese allspice if I’m not feeling like adding the heat of red pepper flakes. You’d have to experiment with quantity. I’ve cooked this soup several times, but tonight the idea occurred to me to bake sweet potato fries, seasoned with this flavor combination (to have with tacos). Has anyone tried freezing this? Any success? If you are suggest and find the better option of this free online fireboy and watergirl games then i have share to you that the most important features tat newly added in this game you really enjoyed with the latest version of this game.